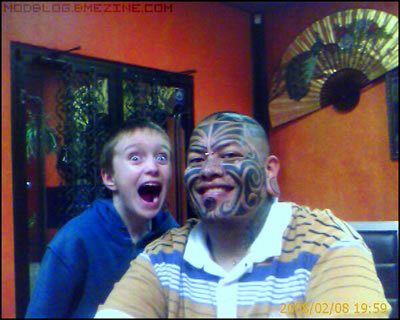 BodyMod In Old School SF - Quant Suff! I know, I know, body modification is very cutting edge. However, old school science fiction writers were already there back in the day. "I couldn't jaunte. I forgot how, is all. I forgot everything, me. Still don't remember much. I-"
He recoiled in terror as the orderly thrust the picture of a hideous tattooed face before him. It was a maori mask. Cheeks, chin, nose, and eyelids were decorated with stripes and swirls. Across the brow was blazoned NOMAD. Foyle stared, then cried out in agony. The picture was a mirror. The face was his own. In modern times, people like Pineapple, here, choose to have this kind of work done. Hopefully, his wife or girlfriend didn't need to be "inoculated with something old, something new, something borrowed and something blue," as was Moira, Gully Foyle's wife among the Scientific People. In his 1968 novel Babel 17, Samuel R. Delany writes at length about a Transport culture that goes in for extreme body modification. Feathers, scales, walrus-sized incisors - you name it and you can get it. You can even get implanted dragons. "It's listed in your catalog as 5463," the Customs Officer declared. "I want it there." He clapped his left hand to his right shoulder. The surgeon returned ... with a tray full of fragments. The only recognizable one was the front half of a miniature dragon with jeweled eyes, glittering sc ales, and opalescent wings: it was less than two inches long. "When he's connected up to your nervous system, you'll be able to make him whistle, hiss, roar, flap his wings and spit sparks..."
Take a look at these tentacle suction-cup implants done by Dark Freak at Luck All in Sao Paulo, Brasil. If anyone can think of more, let me know. Via ModBlog.